For the Lynch Lab, this field season was particularly exciting. With the highly anticipated release of the Penguin Counters on the horizon, teams of researchers began making their way south and boarded the Akademik Ioffe and the Akademik Vavilov in the Port of Ushuaia, Argentina. 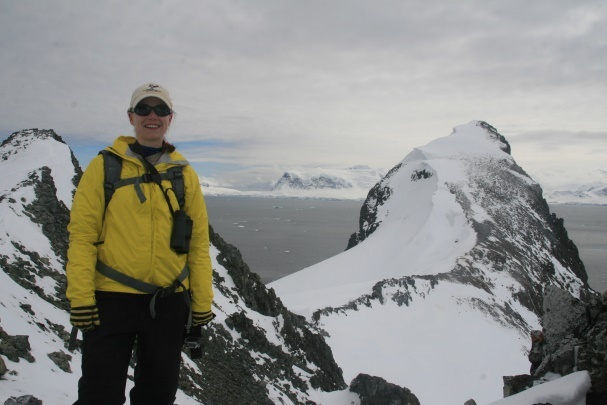 The first trip of the year for the penguin counters brought Dr. Lynch herself out of the lab and by the second week of December we were crossing the infamous Drake Passage. Upon reaching the Antarctic Peninsula, the team began their counting, clickers in hand. 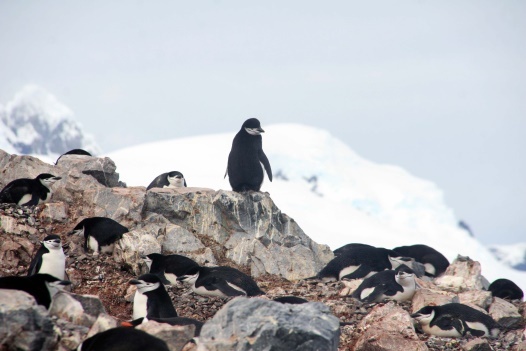 At the first colony alone the team clicked in over 1,400 penguins! Over the course of the season a total of 85,000 penguins were counted, albeit some were sites were counted more than once. Be sure to check out the Multimedia Page on the Lynch Lab website to see highlights from this year’s field season! Coming soon: videos of a penguin-counter’s eye view. After enjoying a few days in the lovely seaside town of Ushuaia at the very tip of Tierra del Fuego – the last bit of civilization to the south – the Penguin Counters set out on our first journey of the year. The Drake Passage had been quite kind to us, with small seas and only light wind. At one point, we encountered about 20 humpback whales feeding at the convergence of the South Shetland Trough & Hero Shelf. After some great looks at the animals, we continued on to the Antarctic Peninsula. Today is my first official day in Antarctica! This morning we visited Port Charcot on Booth Island, where I counted my first penguins and later Petermann Island, the former home of the Antarctic Site Inventory’s field camp. 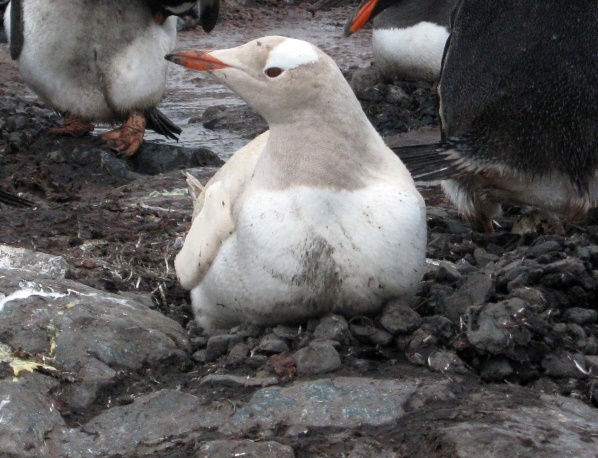 Booth Island is a gentoo penguin colony, with a few Adélie and chinstrap nests scattered throughout. As the zodiac pulled into the landing area, we watched several gentoos swimming in a small cove, jumping in and out of the water. Nearby, a small elephant seal relaxed in the middle of several nesting gentoos. On the hill above, a solitary skua watched every move we made. Having heard war stories of the damage these birds can do to unsuspecting Penguin Counters, the sight was a bit unsettling. As we hiked to the top of the colony, we paused to appreciate the sight. The Antarctic landscape is truly amazing -enormous, ice-covered mountains jutting straight out of the Southern Ocean. Later that evening, we visited Vernadsky Station, a Ukrainian research base and home to some fellow penguin biologists. After a quick tour of the station, we convened with the station biologist to discuss the new colony of gentoos at Vernadsky. After such an exciting day, I can’t wait to see what happens next on the Peninsula! I think today I was officially introduced to the life of a Penguin Counter. We began the day at Almirante Brown, and Argentine base and home to a new gentoo colony. It was really interesting to watch the penguins nesting in this area. I’m told they are generally young pairs, and likely not experienced breeders – and it was obvious. Several of the penguins were on nests that were completely immersed in water or entirely buried in snow! In the afternoon, we visited Waterboat Point, home of a Chilean base, two leucistic penguins and an immense amount of guano. As we neared the colony, the smell became more and more apparent. If you didn’t know already, penguin colonies smell. It’s not a subtle waft of fishy animal odor. It’s a knock-you-off-your-feet, holy-cow type odor. Once we began counting, we were walking through the colony ankle deep in the bright pink, fishy smelling goo. And wow! That stuff is slippery! Shortly after beginning our count, we encountered two leucistic penguins. These are individuals which do not produce black pigment in their feathers. Rather than having the characteristic penguin tuxedo, these birds were more of a cream color with brownish cap on their head. They are absolutely beautiful and stand out quite remarkably in a colony composed entirely of black and white bodies. What a beautiful day on the Antarctic Peninsula! This morning, we counted a gentoo colony at Neko Harbor. These penguins certainly chose nests with views! Surrounding the colony on three sides were massive glaciers calving. 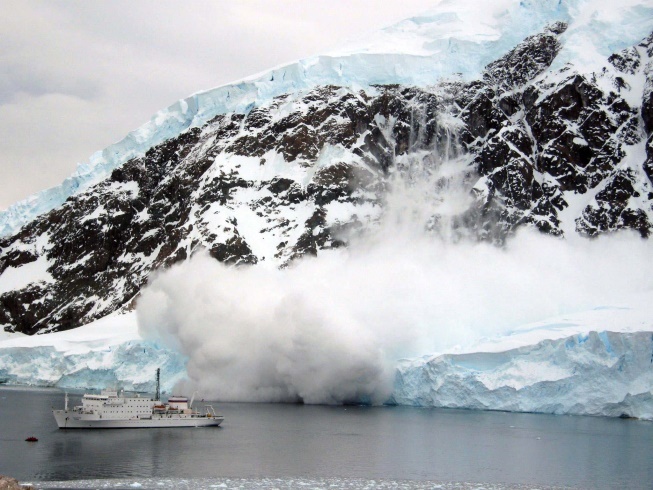 In fact, minutes after we reached the top of the colony and looked back down on the Akademik Ioffe, we watched an avalanche race down the side of a mountain a mile away and engulf the ship in a cloud of snow. It was truly amazing to witness the power and unpredictability of this last wilderness. 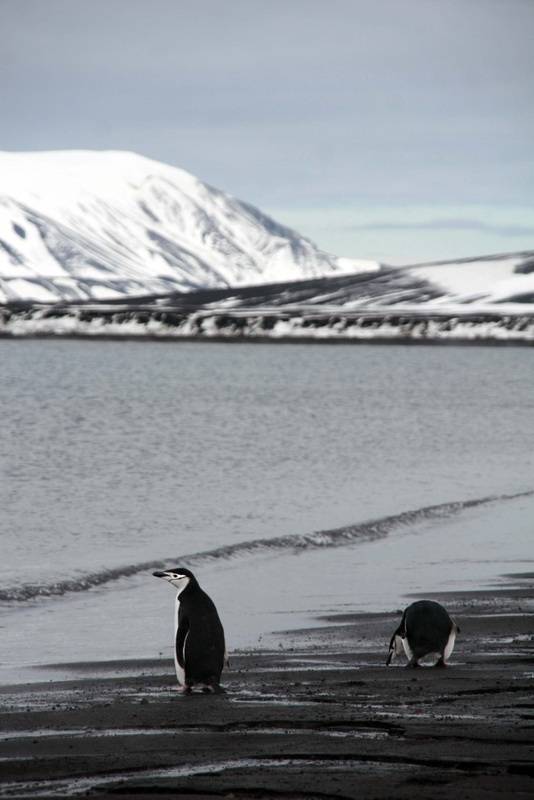 In the afternoon, we counted gentoo penguins at Cuverville Island. We knew this colony was very large, so we planned to be dropped off early and count through the night. 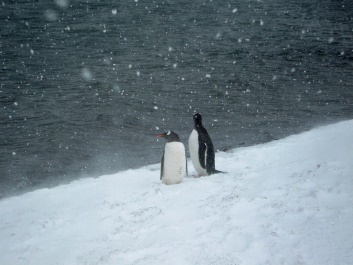 When we arrived at the island, I had my first introduction to rough penguin counting conditions. 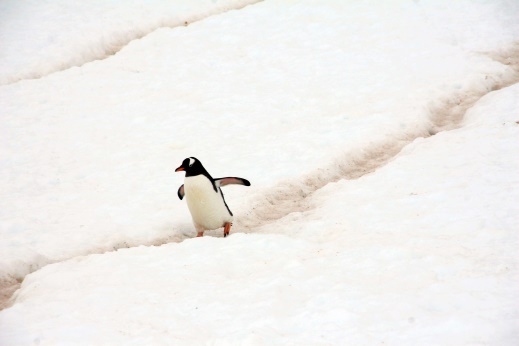 The snow at Cuverville was very soft, making walking among the penguins extremely difficult. We strapped on snowshoes, and got to work. 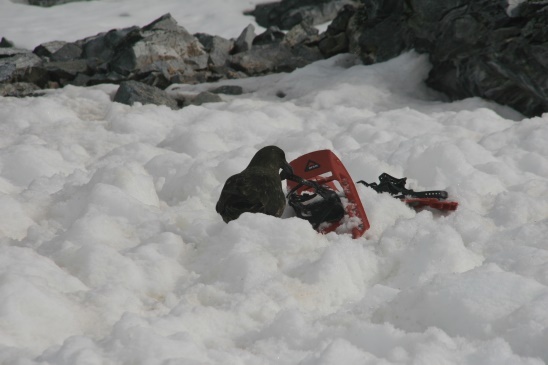 At one point, I had taken off my snowshoes to climb a rocky cliff face in search of penguin nests and returned to find a skua had claimed my snowshoes and was peacefully resting on top of them! After hours of searching we counted over 6,000 gentoo nests! It was absolutely incredible to see so many amazing creatures in one place. Today was a bit of a slow day in terms of penguin counting. We spent the morning at Selvick Cove, where we counted a small colony of gentoos and chinstraps. Once we were finished counting, we did some reconnaissance to figure out where the chinstraps are nesting at nearby Spigot Peak. When people say that chinstraps are the mountain climbing penguins, they are absolutely correct. It was incredible to see how high along the ridge the chinstraps were nesting! As we climbed to the top, penguins would be toddling along a penguin highway next to us to reach nests at the very top of the ridgeline. These are amazing birds! This afternoon, we didn’t have the opportunity to count penguins. Instead, we went to Wilhelmina Bay, where the expedition staff offered zodiac cruising and whale watching. 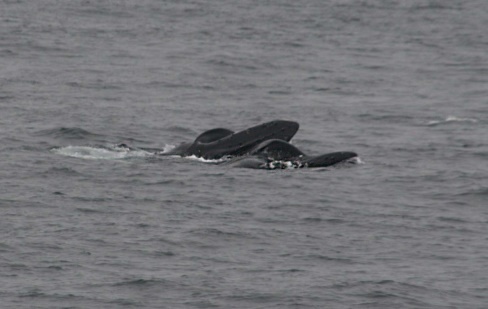 We cruised the bay and watched a pair of humpback whales feeding among the icebergs. These animals are truly amazing. At nearly 50 feet long and 50 tons, it always surprises me how graceful these enormous animals are. 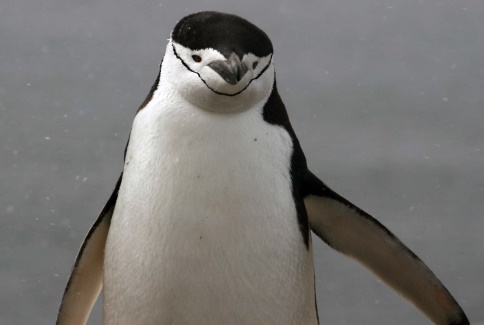 Today was an exciting day for the Penguin Counters aboard the Akademik Ioffe! We spent the morning at Deception Island. Deception is a small, volcanic, ring-shaped island. To reach the interior harbor, ships must pass through Neptune’s Bellows, a small opening, barely wider than the ships themselves. We spent our time in Whaler’s Bay, which was home to an extensive whaling operation in the early 1900s. Particularly interesting was the black sand beach, heated by geothermal vents so it was actually steaming. While there were no penguin nests to count at this part of Deception, we used our time to make a multitude of educational videos and search for banded skuas. During this time, we were visited by a few curious chinstrap and gentoo penguins. 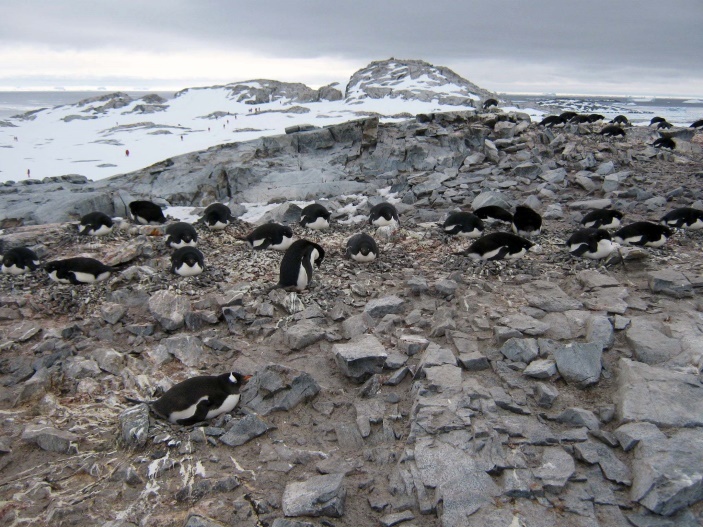 Later, we visited Half Moon Island and counted a chinstrap colony. Counting chinstraps is fun because they take you high onto the island and they seem to have the most personality. As you move among the colonies, you see beautiful displays between reunited pairs and when a chinstrap is annoyed with you, you know it!